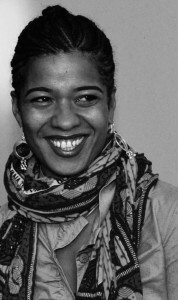 Olumine Popoola is a London-based Nigerian-German author, poet, performer and speaker, who presents internationally, often collaborating with musicians and other artists. She currently lectures creative writing at Goldsmiths College, University of London and her publications include short stories, critical essays and poetry. Her novella This Is Not About Sadness came out in 2010 and her play Also by Mail was published in 2013. Her work concentrates on a critical investigation of the ‘in-betweens’ of culture, language and public spaces. She is currently working on a new publication, entitled Breach, which will be a collection of short stories, based on interviews with refugees in Calais.